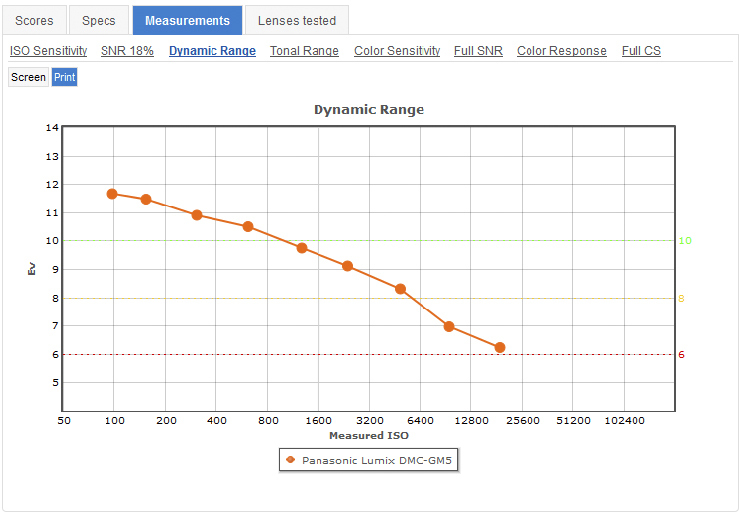 An overall DxOMark Sensor Score of 66 points positions the Panasonic GM5 in the middle of the road for hybrid cameras featuring an APS-C or FourThirds sensor. In fact it’s a point ahead of Canon EOS M2 with 65 points, despite the Canon option featuring an APS-C sensor that’s physically around 30% bigger than the FourThirds variety preferred by Panasonic. The GM5 still lags behind most Sony hybrids however – which are the class leaders in this category, as well as the latest Samsung mirrorless options boasting an APS-C sized sensor. The GM5’s overall DxOMark score of 66 ranks 137th for all sensors and offers no improvement over its predecessor the GM1, also with 66 points. That’s no surprise really, as they both utilise the same 16Mp CMOS sensor, so the advantage of the latest model lies in its built-in EVF and hotshoe. 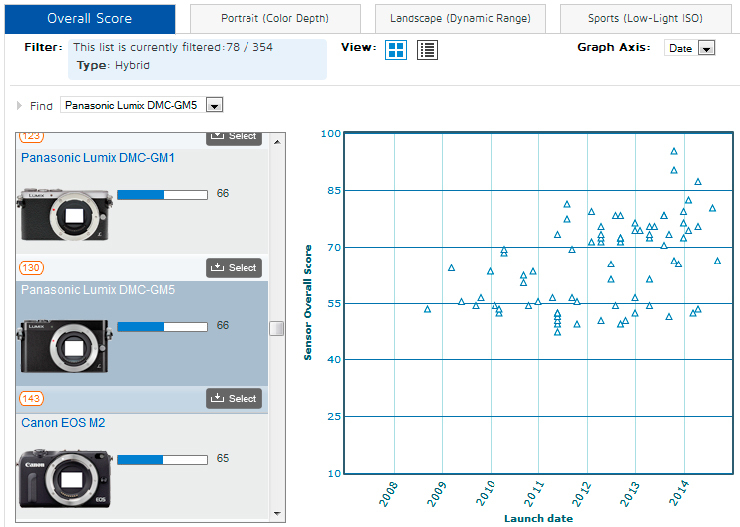 Looking at the GM5’s sub scores underpinning the overall DxOMark Sensor Score, its Dynamic Range score of 11.7 EVs ranks 135th overall. Its best performance is for Low Light ISO where its score of 721 ISO ranks in 127th place, but the GM5 doesn’t fare quite as well for Colour, which charts further down the table in 156th place with 22.1 bits. 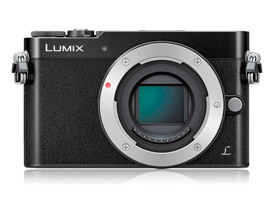 Ranking in 5th place for Panasonic hybrid cameras, sensor performance of the GM5’s falls a little behind some of the Micro Four Thirds competition. 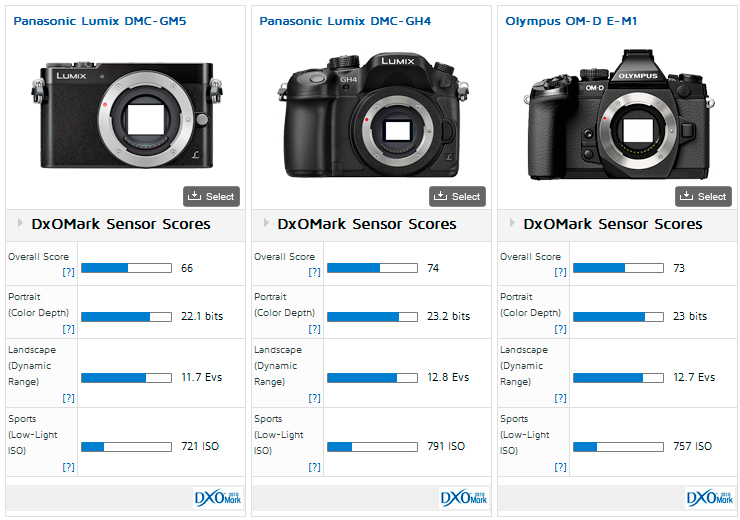 The highest scoring options in this category are Panasonic’s own GH4 with 74 points, or the Olympus E-M1 with 73 points, both of which offer around ½ stop better image quality than the GM5 overall. This is slightly surprising really as they all feature a 16Mp resolution on the same sized chip, but the GH4 and E-M1 boast 2/3rds of a stop improved Colour Sensitivity and 1 stop better Dynamic Range. 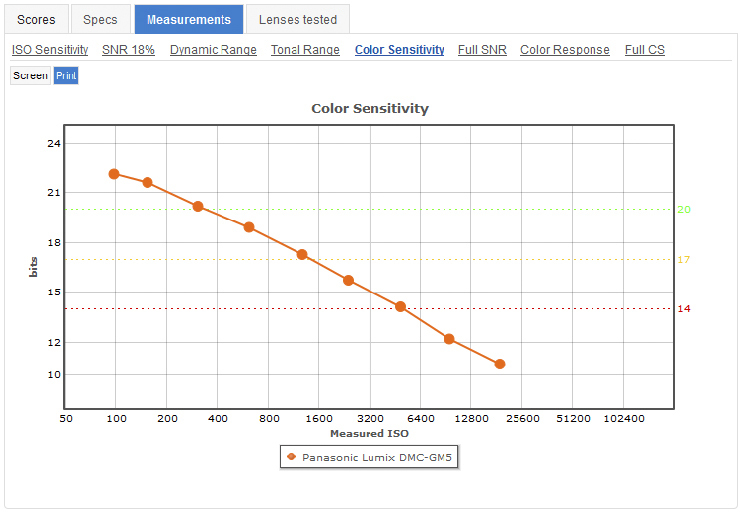 In fact results correspond to the previous Panasonic GM1. The strongest aspect of the GM5 is lowlight ISO however and here the other two cameras do not offer any significant improvement. 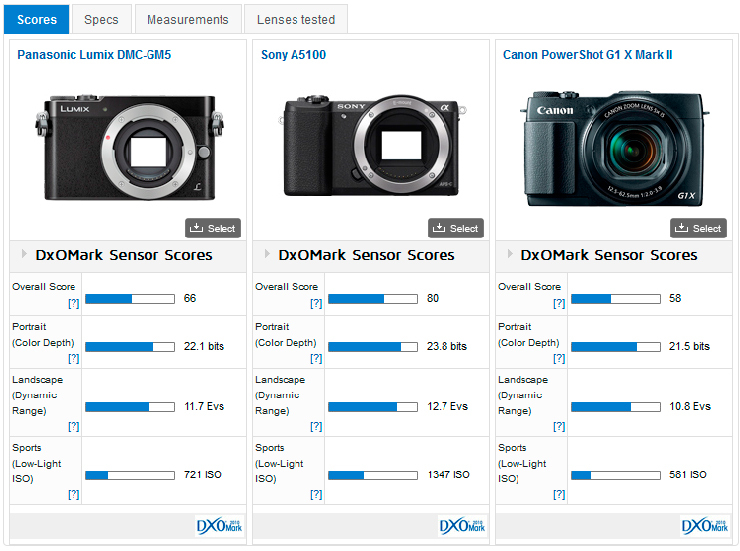 With a DxOMark Sensor Score of 82 the Sony A6000 offers around 1 stop better image quality overall than the GM5. The Sony A6000 is currently the highest scoring hybrid on the database and like the GM5 features a small and compact build. 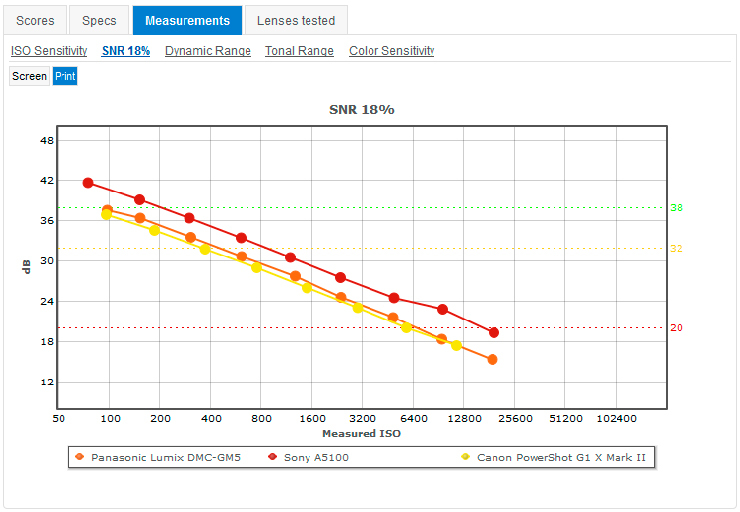 The A6000 utilises a larger APS-C sensor however and for color its score of 24.1 bits trumps the GM5 by over 1 stop. 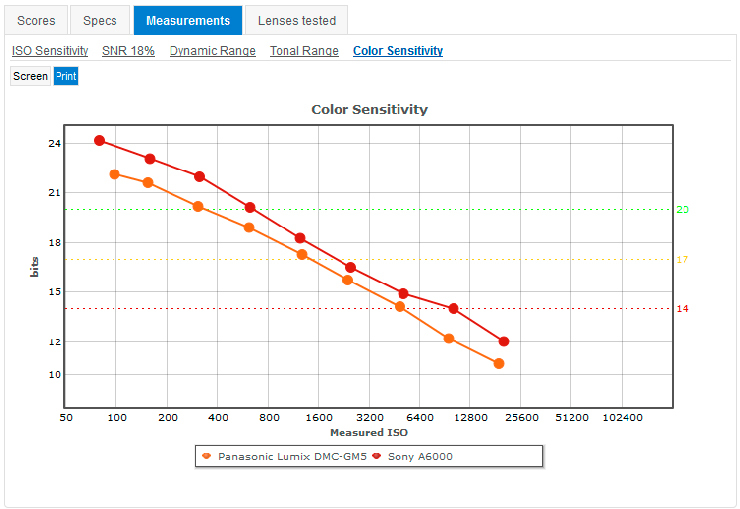 The most pronounced difference for Color is noticeable at the lower ISO sensitivities between ISO 100 – 800, as well as at the very high sensitivities of ISO 12,800 and 25,600. It’s a similar story for Dynamic Range where in the middle of the ISO range, between ISO 800 – 6400, results are comparable for the GM5 and A6000, but it’s at the lowest and highest sensitivities where the A6000 comes into its own, offering over 1 stop improvement at the base ISO and almost 1 stop at the highest sensitivities, too. Pitched against the Canon PowerShot G1X Mark II with its relatively large (albeit multi-aspect ratio) 1.5-inch type CMOS the diminutive GM5 edges ahead in the performance stakes. It has around +1/3 stop improvement in color, close to +1 stop wider DR (at base) and around +1/3 stop improvement in our low-light score. Compared with the Sony and its larger APS-C sensor there’s a more noticeable gap in the performance characteristics with the GM5 lagging behind. 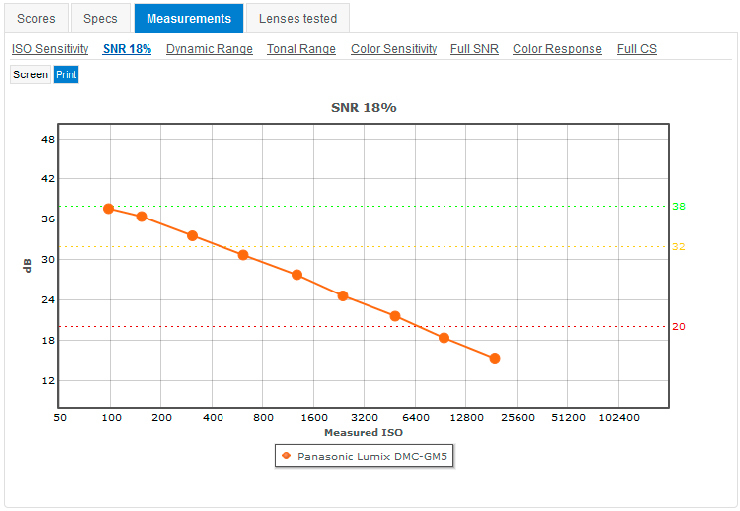 It has around -1 1/3 stop lower color depth, close to -1 2/3 stop narrower DR and around -1 stop less sensitivity in low-light. If you’re after a small and compact hybrid the addition of a built-in viewfinder, hotshoe and accessory flashgun with the new GM5 offers more versatility than the GM1. There’s no discernable improvement in image quality over the previous GM1 model however, which is still available to buy and for a little less money, too. 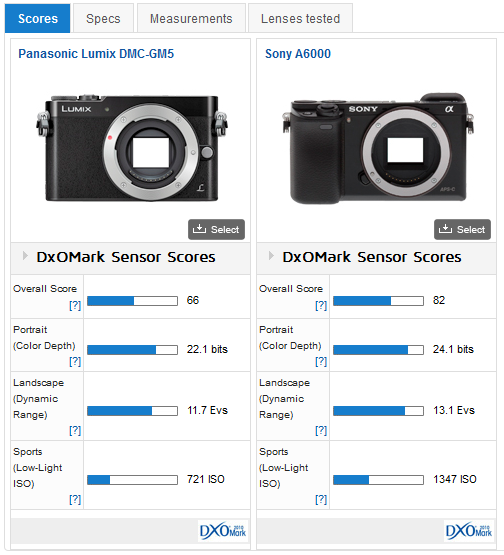 With a DxOMark Sensor Score of 66 the GM5 certainly puts in a respectable performance for image quality too, but if it’s the best hybrid image quality you’re after, scores from the APS-C sensors found in Sony and Samsung hybrids remain the ones to beat.